A clear line can be drawn from A Taste of Honey by Shelagh Delaney through to Rita, Sue and Bob Too by Andrea Dunbar, and on to Beautiful Thing by Jonathan Harvey, which has just opened at the Royal Exchange. All three plays take a poke through the underbelly of life and the people at the bottom of the pile who are excluded from everyday society. Beautiful Thing takes its cue from A Taste of Honey in its portrayal of fumbling gay teenagers and an overbearing, brassy mother; while the brutal demotic of council estate life in Dunbar's world clearly mirrors Harvey's south London high-rise hell. Harvey's play was subsequently made into a successful film, while he himself went onto greater things with Gimme, Gimme, Gimme and latterly as a scriptwriter for Coronation Street (there are even in-jokes about Corrie in the script). And watching this revival of his debut makes you realise how perfectly matched his writing is to soap operas: short, sharp scenes where nothing is wasted, quick-fire emotional flare-ups, and families whose members act like desperate shipwrecks huddled together on a raft with no escape. 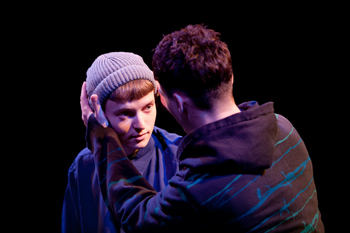 The play centres around Jamie – haltingly played by Matthew Tennyson – and his burgeoning homosexuality. Bunking off school to escape the bullies and football practice, he hovers round his home estate like a fly waiting to be swatted, trading insults with fellow school absconder Leah and barmaid mum Sandra. The play belies its origins as a debut and jumps from calm to crisis quicker than you can say kitchen sink drama, but its emotional punch is real enough. Interestingly, Jamie's neighbour and schoolmate Ste – the star of the show as played by the brilliant Tommy Vine – is the one whose character properly develops during the play. We are invited to view his doubts and fears over his gay relationship with Jamie with real tenderness; conversely, Jamie is not an entirely likeable character, too lightly sketched to engage fully. Jamie's mum, Sandra, is played by Claire-Louise Cordwell as the tart with a heart, all bras and brass neck. Cordwell plays her with comic gusto and grimace and steals the show on more than one occasion with her scornful put-downs. Almost in spite of the fact that the play is peopled with council house stereotypes – the boozy, foul-mouthed mum, the teenager who gets beaten up by his drunken dad, the dippy teenage girl who wastes her life away on drugs – there is a directness to the writing which cannot be ignored and which accounts for its enduring success. As Jamie and Ste explore their sexuality and look to the wider world for recognition of their relationship, Sandra too takes stock of her life, ditching her clingy boyfriend and moving on to her next pub tenancy, bringing the drama to a satisfying close. Short of revealing what it is, the play also contains a surprising and uplifting ending guaranteed to melt the heart of even the hardest cynic.